Want something quick, delicious and double cheesy? 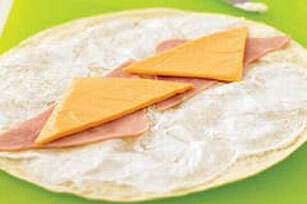 Get out a flour tortilla to make this easy Cheese Roll-Up. Spread tortilla with cream cheese spread. Top with ham and Singles; roll up. Place on microwavable plate. Microwave on HIGH 10 seconds or just until warmed. Take this tasty roll-up to work as part of your lunch. Pair with fresh fruit and fat-free milk. Prepare as directed, using PHILADELPHIA Garden Vegetable or Chive & Onion Cream Cheese Spread.